greatOFeed - Better Omega-3s, Better Omega-6:3 Ratios. Greater Profits. Superior Delivery of Omega-3s for Better Performing Animals and Healthy Customers. Better Omega-3s, Better Omega-6:3 Ratios. Greater Profits. greatOFeed by NBO3 improves animal performance and productivity for a wide range of animals at all life stages of your operation. By delivering superior levels of Omega-3s to your animals and by boosting total Omega-3s in your animals, greatOFeed restores a natural balance of Omega-3 to Omega-6 fatty acids. greatOFeed is an easy to use performance fatty acid feed supplement added to your existing feed ration. We customize our recommendations based on your priorities to achieve the best Omega-3 and Omega-6 balance for your operation. With greatOFeed you’ll see the difference in animal productivity and quality, and your customers will see the difference in meat, milk and egg quality, nutrition and profit potential. 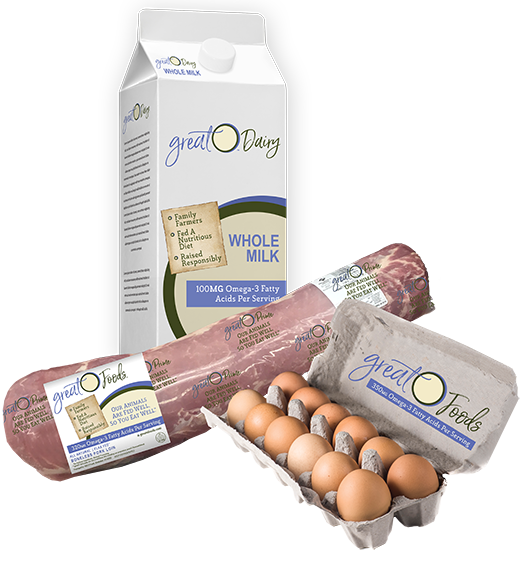 Delivering the highest levels of Omega-3s to meat, milk and eggs gives your customers an edge in the natural, healthy and better-for-you category. That’s more money for your customer, and more money for you. Talk to our experts and get the right greatOFeed program for your operation today. Contact us for more information and customized solutions.